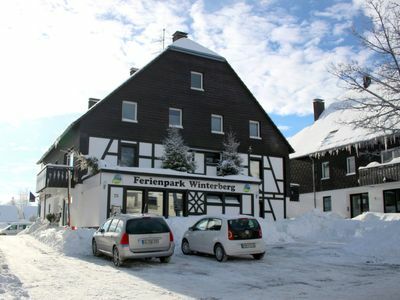 Modern resort "Ferienpark Winterberg". On the outskirts, 1.5 km from the centre of Winterberg, in a quiet position, 3.5 km from the skiing area. In the house: reception, storage room for bicycles, storage room for skis, central heating system. Bread roll service possible (extra). Parking at the house. 10 minute walk to the centre. Walking paths from the house, cycle lane 100 m, ski lift 3.5 km, skisport facilities 3.5 km, ski rental 50 m, ski school 3.5 km, children's ski school 3.5 km. Nearby attractions: Erlebniskappe 3.5 km, Bike- und Trailpark 3.5 km. Well-known ski regions can easily be reached: Skikarussell Winterberg 3.5 km.